So I have a question, or a topic of discussion for the board regarding mattias ( Karlsson) falck. First off I love watching mattias he’s a player I come back to and follow on fairly regularly. And I absolutely love the fact that a player that plays at such a high lel and does it playing sp on his fore hand. I just really love the diversity in the sport and I like seeing how someone uses different equipment effectively at his lel and wins. But my question is what advantages do you people ( I’m sure people that know, understand, and are seeing more than I do) think he’s getting playing short pips on his forehand. For fun and do those advantages out-way the things he’s giving up? Now he’s playing them so he must think there the advantages do in-fact out weigh what ever disadvantage he might have and he’s obviously comfortable with them so there that. also I look over and I see former world champ and one of my all time favorite players persson is his coach shitting in his corner. So I know he’s getting sage in-site and coaching etc. and there are indeed things I’m not understanding and thought it would be interesting to hear a discussion on the topic. It finish off my post the main reason I keep coming back to watch mattias is because I personally want to watch and study a tall player that plays at the table that able compete and move like he’s does. And second because I love watching and studying his truly dangerous backhand his best most dangerous weapon. the reason I’m asking the question is because even though he moves incredibly well he’s still can’t possibly move as quick as smaller players, and two I know he has different back hand shots quicker topspin drives which are amazing but his very spiny and dangerous backhand loop is a pretty big stroke. And if it comes back especially wide to the forehand we’ll split seconds matter, and he is sometime not in position to dangerously attack with his short pips fh since sp require the ball to be a bit higher for his truly dangerous fh sp shots. I realize I’m splitting hairs here and he’s amazing, IDk I but if I’m honest just can’t help thinking if Mattias played smooth fh rubber those balls that drop below the table, you end up having to reach for, or that your slightly late to, could end up coming back a bit more dramatically with a larger window for success/ safer and ultimately buy him seconds in his game. Basically allow him to put more ball away with his back hand like he did recently against Harimoto recently. Again I love the fact someone is playing sp’s at such a high lel. I do think there is a place for it in our modern game. I really love watching the amazing Japanese female players (forget her name and not going to look it up right now) that play sp so amazingly. But she also a really different type player being a smaller really quick player. Anyway I was just thinking about this and I though it would be fun to discuss, as I said I know there are things going on that I’m not picking up on in mattias game and I would love to hear thoughts on this. Bump. I love posts that are made on the !Phone because of its provocative spell check. LOL! From what I saw on youtube, Mattias said he had a poor backhand when he was younger and his coach recommended short pips to help with a shorter stroke. Guess that stuck. One advantage is that with a flatter forehand, he can adopt a much more backhand oriented grip which is definitely his strong point. As a shakehand forehand sp player myself I can't say there are many advantages to playing with sp on the forehand. Like you said most of the time you're out of position to really be able to capitalise on the pips and you lose a lot of capabilities in terms of reach and retrieval that can actually put pressure on the opponent. The main reasons why I stick to it are because I'm used to it and the ball just flies off my bat if I use inverted since I'm so used to configuring my stroke to compensate for the low throw of pips. The main advantage i would say comes from having a combination racket that results in variation in rhythm and speed during blocks. Tbh I think the original idea behind such a style was straight foreward, opening backhand loop, steady ralling and quick forehand winner once the opportunity arises. In practise the implementation is a little counter intuitive since forehand pips requires your stroke to be controlled so you can't really go too crazy with it. In his games against Harimoto and Lin Gaoyuan, I notice a pattern. Due to his explosive sp fh, his opponents tend to attack his bh. To their surprise, Falck's BH is spinny and explosive. You can see Harimoto (who has one of the best bh) struggled with Falck's bh. What turned the tide in his game against Lin Gaoyuan is when Lin served short to Falck's fh. Due to his slippery sp Falck's loop return was not spinny and weak. That gave Lin easy opportunity to attack. Yeah so in my opinion, what makes Falck great is his explosive spinny bh. Being a tall person his bh can cover a lot of areas. Another person with similar awesome bh is Hugo Calderano. Advantage: serve return, the short game and is able to kill the ball well. Disadvantage: A big one! Bad at third balls. The chinese he played lately would have not won without the halflong serve to mattias forehand. I am surprised that they do not serve more like this or push more long against his short pimple. Everyone that play at a decent level knows that this is a big disadvantage of short pimple. 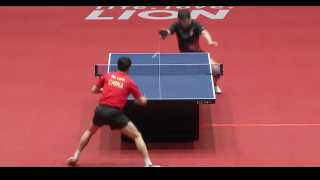 They know it is very difficult for him to play hard, and he do not get so much spin so the opponent can play aggressive counterloop on the next ball. It is very important for him to open low, far away on the table and vary the placement. If he had dared to open more pararell/straight against the chinese the chinese would not have been able to cheat, and go around with the forehand in the backhand corner so easily. if he had vary the placement more on the opening loop and used a short pimple with more grip he proably would have won i think. But with a grippier short pimple rubber he is proably more sensitive for spin and it is harder to have so good short game. Definitely noticed this as well. I think Gaoyuan wone ever point (except maybe one or two) off that short wide fh serve. gmiller2233, when they asked me to write a custom essay about greatest players of all time - I've written about mattias like one of them. His techniques and smashes are really awesome, and he CAN move as quick as smaller players. Maybe you didn't see few last championships he was taking part in.